Looking for a great alternative to a bassinet or baby pillow lounger? Offering the perfect incline for sleeping, lounging and feeding, the DayDreamer is the most comfortable and versatile infant seat on the market today. Before DayDreamer, finding a safe sleeping area outside of the nursery was difficult because moving portable playards or bassinets around the house was so cumbersome. DayDreamer was invented so that you can be with your baby while still being able to enjoy doing all the other things you like to do. Whether you are exercising, working on your computer, or just reading your favorite book, you can be assured your precious one will feel like he or she is still being held snuggly in your arms because DayDreamer's ergonomically designed seat is so incredibly comfy. This means a happier and more rested baby that can always be safely near you. DayDreamer's ventilated core and moisture-wicking fabrics help keep your baby cooler by preventing unwanted heat build-up, and our unique seating design insures that soft toys and teethers won't fall out and onto the dirty floor. DayDreamer utilizes an ultra-stable base that rests securely on the ground, so you NEVER have to worry about your baby falling. DayDreamer also features an exclusive one-hand-release safety harness that is the easiest to use release system on the market today. A thin, CertiPUR-US® foam layer offers another layer of comfort for your little one. CertiPUR-US® foam is made without PBDEs, TDCPP or TCEP ("Tris") flame retardants, mercury, lead, heavy metals, formaldehyde, phthalates regulated by the CPSC, and CFCs. CertiPUR-US® foam is performance-tested, durability-tested & emissions-tested by independent accredited testing laboratories. ACID REFLUX or GERD? Our upright design raises your baby's head above the stomach level to the optimal sleeping position; this incline helps alleviate the discomfort that often leads to so many sleepless nights. THE PERFECT "ANYWHERE-ANYTIME SLEEPER"- AND 50,000+ PARENTS AGREE- DayDreamer is portable, so it allows you to go about your daily business while baby is safely dozing close by. Trying to get work done? Making dinner? Need some "me-time" to take that much-needed catnap? You now can now do it all because babies just love DayDreamer. PLUSH COMFORT - There is nothing more comfortable for your baby. 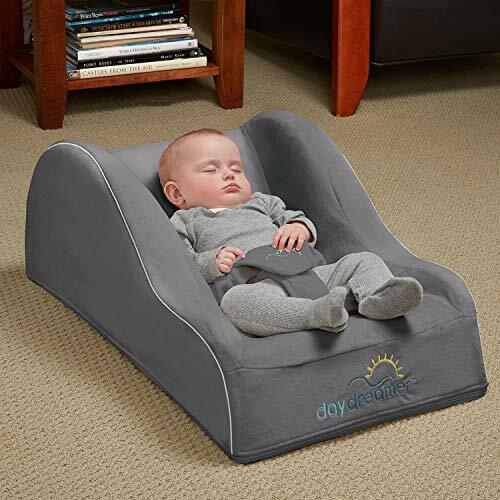 Whether napping, lounging, or feeding, DayDreamer is the answer. Our soft and breathable (moisture-wicking) cover also helps prevent heat buildup which means baby sleeps better. It also has a waterproof seating area. WITH OVER 50,000+ SOLD...the DayDreamer is one of the most popular sleep products on the market today. Built so well that we even offer a Lifetime Warranty. DayDreamer's cover is also fully washable so it can be used child after child without worry of wearing it out. SAFETY TESTED AND APPROVED - For newborn to toddler. The Day Dreamer passes all FEDERAL test standards for sleep products as well as the FEDERAL CPSIA laws of 2008. CertiPUR-US certified foam layer is made without PBDEs, TDCPP or TCEP ("Tris") flame retardants, mercury, lead, heavy metals, formaldehyde, phthalates regulated by the CPSC, and CFCs. Rest assured knowing there is nothing safer for your baby.